MOAB — A geophysical company is proposing to conduct a three-dimensional geophysical seismic survey project involving exploration and acoustic signals in an area 26 miles northwest of Moab in Grand County. 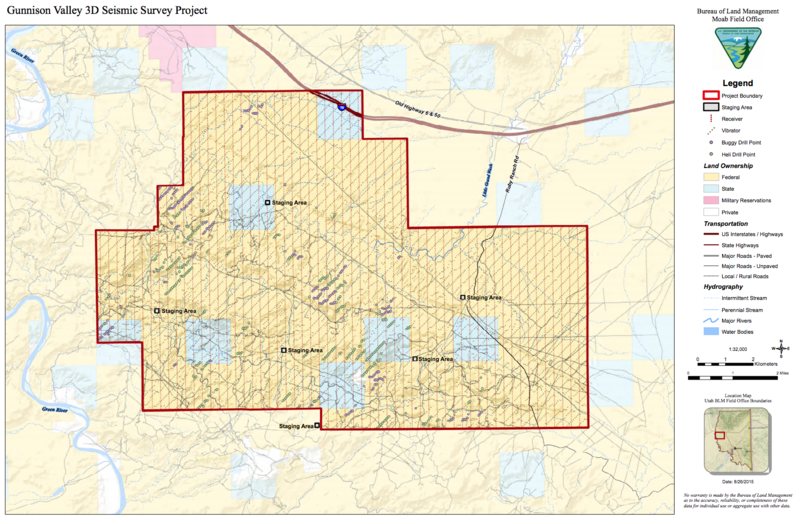 The Moab Field Office of the Bureau of Land Management-Utah is seeking public input on Dawson Geophysical Company’s Notice of Intent to conduct the project that proposes to encompass 60.4 square miles, or about 38,660 acres. This geophysical exploration project will be conducted on approximately 60.4 square miles (~38,660 acres) of federal, State of Utah (SITLA), and fee lands for the purpose of gathering subsurface geologic data to be utilized in defining and mapping the presence of subsurface oil and gas reservoirs. The Gunnison Valley 3D seismic survey would be a mixed source geophysical exploration project, employing acoustic signals. The type of energy source used would vary according to site-specific conditions, including vegetation type, terrain, and slope; however, vibrators would be used as the primary energy source. Vibrators would typically be used where slopes range from 0 to 20 percent in easily accessible areas. Buggy drills would be used in areas where vibrators are not able to access and slopes would typically not exceed 35 percent. Heliportable drills would typically be used on slopes greater than 35 percent, or in areas where terrain hinders safe access with vibrators and buggy drills. Of the 10-15% that are drilled shot holes, 40 percent would be drilled with buggies and 60 percent with helicopters. One helicopter would be used to support drilling, and one helicopter to support data acquisition. The proposal also includes 6 staging areas for helicopter landing and staging equipment and crews. The seismic survey is proposed to begin the winter of 2015-2016. Following the public scoping period, which ends Oct. 19, the BLM will prepare an environmental assessment to analyze potential impacts associated with the project. The BLM encourages the public to provide comments, it said in its press release, to help identify relevant issues that will influence the scope of the analysis and guide the development process for the environmental assessment. The proposed project and maps are available for review at the Moab Field Offices, 82 East Dogwood, Moab. The project information can also be accessed and comments submitted electronically, using the BLM ePlanning website. See the Gunnison Valley 3D Seismic Survey Project home Web page and navigate links to documents and other project materials and data that may be posted. Written comments will be accepted until Oct. 19. The BLM’s release notes that the most useful comments are those that identify issues relevant to the proposed action. Comments that contain only opinions or preferences will not receive a formal response but may be considered in the BLM planning process, the release states. Please reference “Gunnison Valley 3D Seismic Survey Project” when submitting written comments. Before including an address, phone number, email address or other personal identifying information in any comments, be aware that the entire comment — including personal identifying information — may be made publicly available at any time. Requests to withhold personal identifying information from public review can be submitted, but the BLM cannot guarantee that it will be able to do so. All submissions from organizations and businesses, and from individuals identifying themselves as representatives or officials of organizations or businesses, will be available for public inspection in their entirety. For additional project-specific information, please contact Rebecca Doolittle at 435-259-2141. Persons who use a telecommunications device for the deaf (TDD) may call the Federal Information Relay Service (FIRS) at 1-800-877-8339 to leave a message or question for the above individual. The FIRS is available 24 hours a day, seven days a week. Replies are provided during normal business hours. Native Born should be along any minute now with her anti-BLM diatribe and whining. he or she? humm… aint NM a guy?